How to Stop My Hamster From Chewing the Bars of the Cage? Do you have a hamster that just won’t stop bar-chewing? Don’t be alarmed as this is a normal thing to experience as a hamster owner. And after researching this topic, we’ve discovered ways to prevent the bar-chewing from reaching excessive levels. Depending on the cause, you can address bar-chewing in many different ways: Getting a bigger cage, allowing more playtime, offering chewing alternatives, and investing in more toys, tunnels, and wheels. And if none of that works, you can put lemon juice on the bars as a last resort – or switch to a glass tank with no bars. This brief overview moves through these solutions rather quickly. I’ll use the rest of this post to dive deeper into the issue at hand. If you continue reading, I promise this information will help ensure your hamster’s bar-chewing doesn’t keep you up at night! The first thing you need to understand is that chewing on objects comes naturally to hamsters. It’s a part of their biological process because their incisor teeth are always growing: the chewing helps keep the size of these teeth in check. Hamsters should get plenty of safe chew toys which they can munch on to their heart’s content. If a hamster still takes an occasional nibble at the cage bars, that may be ok. 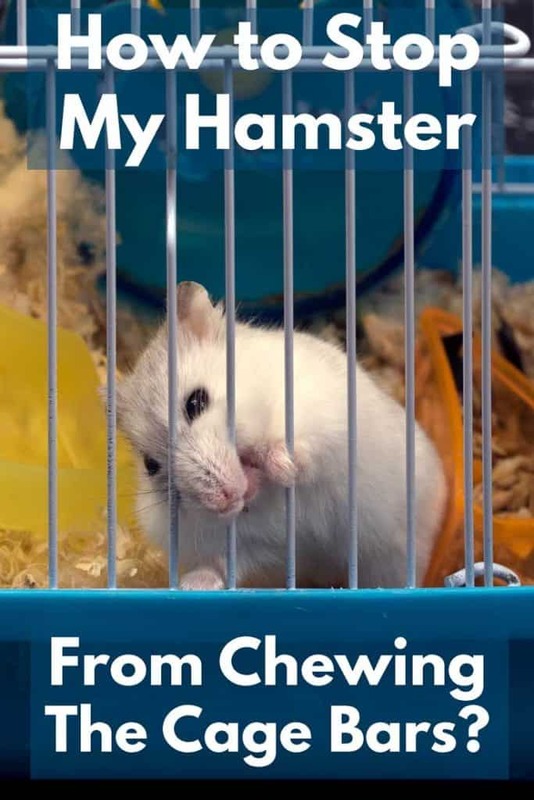 But sometimes, chewing the bars becomes excessive and too much gnawing on the metal can harm your hamster’s teeth. To stop this behavior, we must first address why a hamster’s bar-chewing habit has escalated? Why Your Hamster’s Bar-chewing Has Increased? There are many different reasons your hamster bar-chewing habit has become excessive. The main ones are simple things like boredom, the cage is too small or merely wanting your attention. 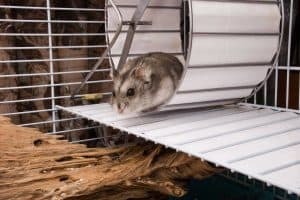 If the cage’s floor space is under 360 square inches, the bar-chewing could be a symptom of your hamster feeling trapped. Hamsters need a lot of room to roam for their daily activities of running, burrowing, storing food, etc. It also doesn’t help that hamsters aren’t used to living in such a confined space. Hamsters in their natural habitat are free to roam wherever they please. And a cage is the antithesis of the natural environment they’d be used to in the wild. When the cage is too small, the hamster’s natural instinct tells him to try and get out – by literally chewing its way out. The solution for this issue is simple, get them a bigger cage. Once you offer them a more substantial living space, their bar-chewing should cease. It will provide them with more to do and room for their various adventures. Another way to increase your hamster’s territory would be by using tunnels. You can construct complex structures of hamster tunnels, providing your hamster with safe areas to explore and spend time in. The most probable reason behind your hamster’s bar-chewing is boredom. The bar-chewing becomes a symptom of your hamster not having enough mental stimulation. I mean, how long could you keep doing the same things and stay completely sane? I’d imagine not very long, and your hamster’s attention span is much shorter than yours. The bar-chewing becomes an outlet, which gives them something else to do inside their cage. It’s their cry for help. If you’re convinced your hamster’s bored, you need to offer your pet more stimulation. This is called environmental enrichment. You create an environment with more stimuli that help your hamster exercise their physical and mental capabilities. More stimuli keep your hammy busy and away from chewing the cage bars. Adding a variety of hamster toys. Constructing a maze of hamster tunnels. Enriching your hamster diet with healthy treats. Taking the hamster out of his cage more often. Make sure a good hamster wheel is available at all times. Some people remove the wheel during the night, to avoid the noise. This could actually be very stressful for a hamster, eventually leading to stress-related behaviors like bar chewing. I understand the reason behind this decision; it can be quite frustrating to try and sleep with a hamster running on their wheel all night. But this action takes away your hamster’s primary outlet for all their built-up energy. It would be in both of your best interests to keep the wheel functional during the night. There are several low noise-operation wheels available on the pet product market. My personal preference would be getting this one as it has numerous positive reviews. Regardless of the option you choose, it’s all about finding a way to rid your hamster of their nervous energy: treats, more wheel time, or having a play session right before bed. Any of these options – and preferably several combined – would help. Some hamsters start bar chewing as a way to get their owner’s attention. It has nothing to do with energy building up or the cage being too small. It’s instead about your hamster feeling that you don’t spend enough time with them. This reasoning might sound weird given hamsters tend to be very solitary creatures. But some hamsters do bond with their owners and miss their owners when they’re left to their own devices. It’s even been proven that hamsters have mood swings, which also account for their sudden need for socialization. Spend more time with your little guy. I’d invest in trying to have a long play session right before bed or have several during the twilight hours. You could also take them out of their cage and let them hang out for a bit. But you must make sure you don’t reward the bar-chewing behavior. Your hamster will just continue doing it as they’ve seen it get results. Instead, ignore them until they stop and then start to spend some time with them. Your delayed reaction will convey to them that bar-chewing will not get them your attention, but being quiet and patient will. And once you do start spending time with them, act like it’s any other playing session. Do whatever you feel makes your hamster know that they’re apart of your family. I feel the best option is petting them and letting them have a little hangout time outside their cage. It will calm your hamster down and convey that you’re there for them in their time of need. Never underestimate how much good a petting session can have on your relationship with your hamster! It may turn out that none of the above solutions end up working for you. Some hamsters just like the taste of the metal bars and aren’t trying to tell you anything. If this seems like the case for you, there’s a last resort option that’ll quickly curb this behavior. But I do implore you to try all the other methods beforehand. The method I suggest below is only to be used in absolutely dire circumstances. All you need to do is rub lemon juice or vinegar onto the bars themselves. It makes the bars unappealing to your hamster and makes them focus their attention elsewhere. But the problem with this method is it doesn’t fix the underlying issue. Which is why you must exhaust the other solutions above before using this one. It should only be used as a last resort; there’s no reason you should skip right to using lemon juice. Can a Hamster Bite Through Their Cage? All this talk about hamster’s bar biting probably pushed the following question to the front of your mind: can a hamster bite through their cage? Can they actually tear the bars apart and get out? If you have a metal cage, the answer is most likely no. 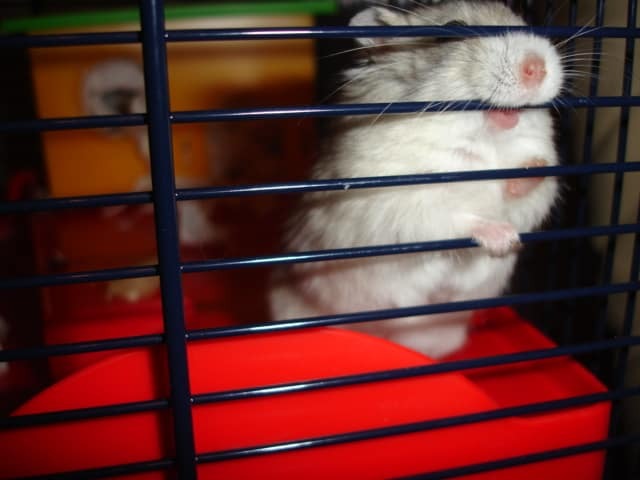 Even the most determined hamster would have an incredibly hard time biting through these bars. They’re typically made from materials that are much stronger than a hamster’s teeth. But on older cages that have worn down bars, your hamster biting through the cage is possible. The hamster could grind down the bars enough that’ll be able to break through parts of the cage. Although this occurrence is still rather unlikely and the cage would’ve had to suffer a significant amount of damage. Will a Hamster Hurt Themselves by Excessively Bar-chewing? We all know how bar-chewing can cause a hamster owner stress. A rattling cage can be quite a nuisance to deal with while you’re trying to get some sleep. But you might be wondering if bar-chewing is something that’s detrimental to your hamster as well? Broken teeth: the bars are much stronger than your hamster’s teeth, which can cause permanent damage. In some cases, it gets so painful that it becomes impossible for your hamster to eat. Bar rub: the skin around your hamster’s nose and mouth can become inflamed from chewing on the bars. It will cause extra stress for your hamster, and sometimes the skin gets infected. Neither of these two issues is something you want to see your hamster go through. It’s heartbreaking to witness and something no hamster or hamster owner should experience. But with all the information you now have gained, I don’t see why you shouldn’t be able to nip it in the bud. So please, take all that you’ve learned and use it to stop this habit in its tracks. Both you and your hammie will better off without bar-chewing in your lives! Next PostDo Hamsters Exist in the Wild? Can Hamsters Jump and Climb?